A selection of public use litter and recycling bins for use in parks, cricket grounds, schools and playgrounds. Choice of PVC and steel anti vandal bins. Cigarette waste bins and ECO parks litter bins. All public use waste bins are pre-drilled to be allow direct fitting to a hard surface. Optional soft ground fixing kits and cement base plates available. We also offer a nationwide installation service. Call for details. Package prices for multi units. Discounted mixed operation packages. Free pole mounted public use recycling litter bins. PVC plastic outdoor public litter waste bins. Steel heavy duty outdoor public litter waste bins. Cast Iron & branded outdoor public litter bins. Dog litter recycling outdoor public waste bins. Steel wall mounted public cigarette stubb bins. Stainless steel outdoor public litter & recycling bins. Natural timber outdoor public litter waste bins. 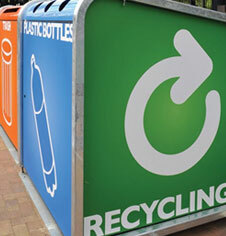 Outdoor public area recycling bins & stations. Indoor mixed office waste collection litter bins. Branded public area outdoor recycling litter bins. Salt and grit plastic heavy duty hopper storage bins.